Child Height Predictor Calculator - How Tall Will Your Child Be? Curious! Know How Tall Your Child Will Be As An Adult? Your ’s Predicted Height will be at the age of 18. How tall would your child grow? As a parent, it’s natural to be curious about how tall my child will be as an adult. The height of a child is largely determined by genetics. Though other factors such as nutrition, exercises, child’s health condition, gender, and the mother’s health during pregnancy also contribute to the height of the child. Scientific studies (1) suggest that a child’s height is mostly influenced by genes and gender. These two factors contribute to 70% of growth and rest 30 % is based on nutritional factors, environmental factors. At times, diseases, illness and certain medications also inhibit growth or shorter stature at the age of 18. The child might be as tall as the average height of the parents. Infants and toddlers grow fast and subsequently the rate of growth descends. It again picks up during puberty. In girls, it levels off at 15 years and boys at 18 years. A child height calculator predicts your child's height using certain parameters such as gender, the child's current weight and height, the parents’ height and so on. There are a number of methods, such as Khamis-Roche and skeletal age, to calculate the accurate height of a child. MomJunction’s predict child’s future height using Khamis-Roche method. This method is 90% accurate. This means your child could be a bit taller or shorter than the predicted estimates. Based on the predictions you can take corrective actions if need be or consult a doctor, change the child’s diet, or include some exercises in their routine. Khamis-Roche height method uses the child’s gender, current height and weight and the height of the parents. 2 to 3 years Grows 9cm approximately every year. Most children double their birth height by the time they are four years old. 3 years to puberty 5cm every year. Puberty causes rapid growth spurts that vary from one child to another. In the US, the average height of males (2) at 20 years and above is 175.7cm ( 5’ 9½”) and females is 161.8cm or (5’ 3½”). 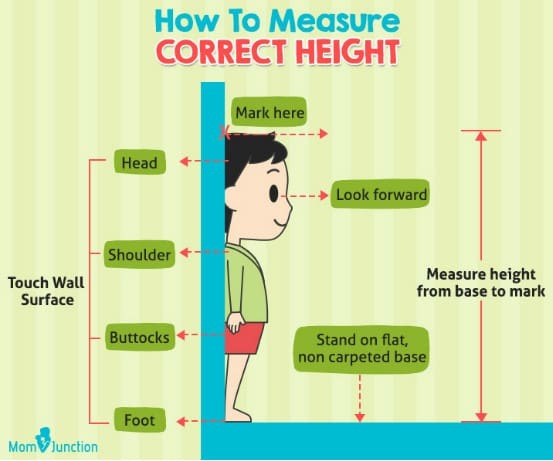 How To measure your child’s current height? Let your child stand on a flat area with their back against the wall. Their heels, buttocks, shoulders, and head should be touching the surface of the wall. Let him look straight. Hold a scale or a book along the tip of his head and mark the point on the wall. Ask your child to stand straight and not move their head up and down while you are marking their height. Now measure the height from base to the mark using a measuring tape. These five parameters helped to predict the height the child would reach as an adult. The skeletal age required an x-ray of the left wrist and hand, so this parameter was eliminated from the Khamis calculator. The older Khamis Roche method doubled the height of the child at two years. But this method was proven unreliable, especially for girls. So, Dr.Roche modified the equation on the basis of the results from the Fels Longitudinal Study (5). The new equations of height formula are proven to be accurate. These early methods help paediatricians and parents to estimate a child’s adult height. But they were not accurate . So, a new statistical model was eventually developed based on the child’s gender, age, current height and weight of the child and the height of the parents from the large longitudinal study . This method is called Khamis Roche Method. It can be applied only to kids over the age of 4. This method provides the table of the coefficient of current height of the child, the coefficient of weight of the child, coefficient of average parental height and Beta coefficient. The height of the child at 18 years can be predicted by obtaining the coefficient from a table, multiplied by their corresponding measurement and added together with beta coefficient. These coefficients are separate for girls and boys. Khamis Roche method can be applied only to healthy Caucasian children. This Caucasian study did not have participants from other races; the study was strictly based on Caucasian kids born to Caucasian parents. Khamis Roche method used to predict the height of children of 4 years and more. There is still a margin of error of 1.7 inches for girls and 2.1 inches for boys in predicting the height of your child at 18 years. Estimation of child height below 4 years of age can be inaccurate. Q. What are the other methods to calculate height of the child ? 1. Mid-parent rule: Designed in 1948 by Horace Gray, the mid-parent child height predictor is based on parent’s average height. (3). Add the mother's and the father's height in inches or centimeters. Add 5 inches or 13 centimeters for boys; for girls subtract 5 inches or 13 centimeters. Divide the sum by two. This method is usually used for children below the age of four. The margin of error in Mid-Parent Rule is plus or minus 4 inches. 3. Bone-age method: This method was derived in 1959 and is considered to be more accurate than the other two methods (6). It involves x-raying the kid's left hand, fingers, and wrist. The bone age is compared to the chronological age. You cannot try this method at home but see a doctor. Q. How Accurate Are Child Height Predictors ? As the name suggests, the calculators only predict the height. Your child's actual height could depend on his overall health, the food he takes, his lifestyle, habits, and even the part of the world he lives in.Baby height predictors, which are based on genes, parent’s height and child’s current health, are considered to be more accurate. Q. What Factors Determine Your Child's Future Height ? Boys tend to be taller than girls (7) because they have a delayed growth spurt at the end of their puberty. This delay gives them the advantage of two years of normal development before the final growth spurt. Till 12-13 years boys and girls have the same height, after they cross that age, girls level off, but boys continue to grow until the age of 17-18. In some cases, girls grow up to be taller than boys based on their parents' height. In addition to the height of the parents, that of the child’s maternal and paternal grandparents influence their height. Having a balanced diet can help the child reach their maximum height. And a diet that lacks the required nutrients can hamper the child’s growth. If the child is eating enough, but not eating the right food then he would be low on nutrition. Exercises are important to be fit and healthy. Besides, physical activity helps in the growth and development of your child. Lack of physical activity can restrict the child's height due to a weak bone structure. Making your child do some height enhancing exercises regularly could make him grow taller. Certain medical conditions such as dwarfism, gigantism, and Turner's syndrome affect the child’s height. Arthritis, celiac disease, cancer or premature birth are likely to have an adverse effect on the child. Gray, Horace. "Prediction of Adult Stature". Child Development Volume 19 Number 3. 3 September 1948. Society for Research in Child Development. Khamis, Harry J and Roche, Alex F. "Predicting Adult Stature Without Using Skeletal Age: The Khamis-Roche Method". Pediatrics. October 1994. American Academy of Pediatrics. Khamis HJ, Roche AF. Predicting adult stature without using skeletal age: The Khamis-Roche method. Pediatrics. 1994; 94: 504-507 (Corrected data in Pediatrics 1995; 95: 457). Disclaimer:While the calculators might give you an indicative figure of your child's height, they are not 100% accurate in predicting the height. Besides, children grow at different rates, some grow rapidly while some are slow. The best thing you can do is to provide balanced nutrition to your child, get them involved in physical activities and make sure they are healthy. If you are concerned that your child is not growing as per the standards, then you should consult a health practitioner.